Honda’s compact coupe delivers style, pluck, and determination. When it comes to model names, the Civic is one of the most enduring ones of all. Introduced to North America in 1973, this one-time subcompact has morphed into a sizable compact model now bordering on the midsize range. Honda remains one of the few manufacturers still offering more than one body style in the compact segment, with sedans and coupes, both available (a five-door hatchback prototype was shown at the 2016 New York International Auto Show). 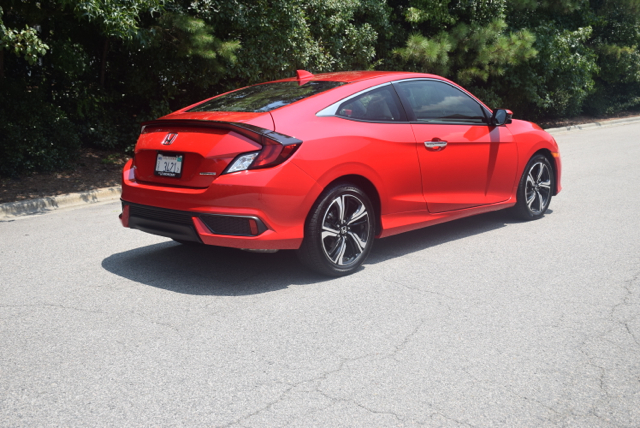 My recent weekly driver was a 2016 Honda Civic Coupe Touring edition, a model with the panache, attitude, and sophistication of far more expensive vehicles. The current Civic represents the 10th generation of this model. Along with the midsize Accord sedan and coupe, and the compact CR-V, the Civic can be counted on for delivering top sales to Honda year in and year out. Still, Honda doesn’t take anything for granted in a segment where such competitors as the Toyota Corolla, Ford Focus, Kia Forte, Nissan Sentra, Chevrolet Cruze, Hyundai Elantra, Volkswagen Golf, Dodge Dart, Mazda 3, Subaru Impreza, and Mitsubishi Lancer compete. The 2016 Civic Coupe starts at $19,050 ($18,640 for the sedan) and is sold in LX Manual, LX CVT ($19,850), LX-P ($20,850), EX-T ($22,300), EX-L ($23,425), and Touring ($26,125) trims. My Civic Coupe Touring model offered no extra charges other than an $835 destination and handling fee, bringing the final price to $26,960. 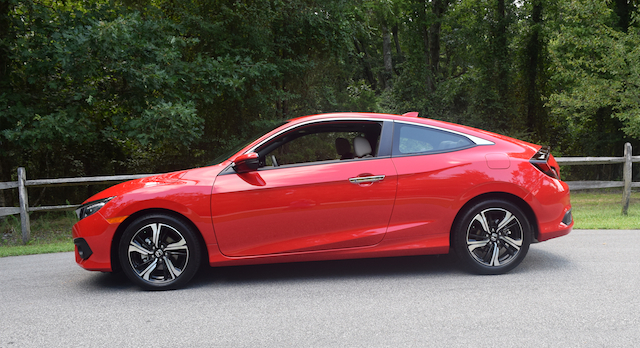 Most 2016 Civic Coupe models are powered by a 2.0-liter, four-cylinder engine. A 6-speed manual transmission is standard; a continuously variable transmission is included elsewhere. For Coupe EX and Touring models, you get a 1.5-liter, turbocharged four-cylinder engine making 174 horsepower and 158 foot-pounds of torque. This engine is paired with a CVT. 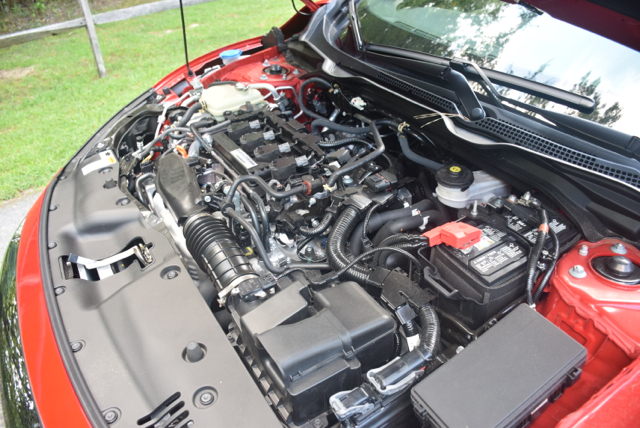 The enhanced powertrain combination enables the coupe to make 31 mpg in the city and 41 mpg on the highway — I averaged 40.3 mpg throughout my week, beating the 35 mpg combined average the EPA sets for this model. What’s the big difference between the tenth and ninth generation Civic? Nearly everything. Let’s start with the exterior — quite frankly, this rendition is the most rakish one yet, offering a sleek sports car-like design. Honda, long “accused” of building bland vehicles, has departed the vanilla build market to produce something shockingly delectable. Up front, the fascia features a long grille, seamlessly integrated with the headlamp assemblies. The chrome trim and LED lighting embellishments provide a unique, sweeping look. The lower grille opening is offset by a pair of boomerang-enhanced embrasures housing the available fog lights. Body sculpting is liberally used across the front fender, on the hood, down the profile, and to the rear. The coupe’s profile features a rising belt line, a sloping roof line, and multiple character lines and body sculpting, suggesting a conveyance always in motion. The roof melds with the hatchback-like rear quarter embellished with evocative combination lamps. Adding additional eye candy are the fashionable 17-inch flange design alloy wheels. The outer casings of the rear lighting assemblies seamlessly connect with the rear spoiler to provide an unusual wing-like presentation. Additional body sculpting, rear bumper trim, a pushed up trunk lid, and dual exhaust tips are other characteristics of note. Honda’s designers certainly didn’t play it safe with the Civic Coupe’s latest composition and its most polarizing one to date. It’s a far cry from the “pregnant roller skate” look of the original, a term we used way back when. Yes, I’m that old. Inside, the drama continues, but compared to the exterior, the cabin is relatively tame. Still, the Touring edition provides its own design pizzazz to raise your visual interest. 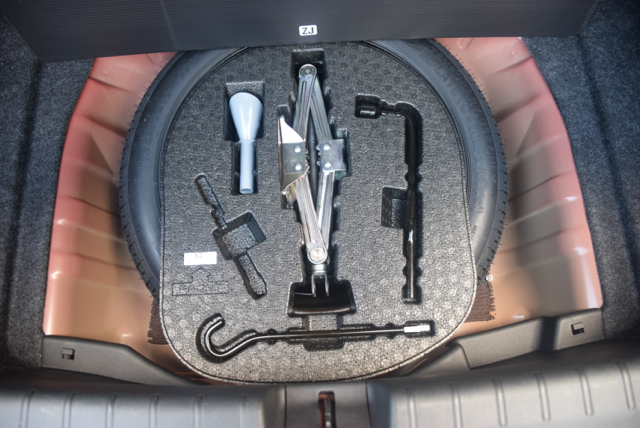 The 2016 Civic Coupe has the expected bucket seats up front and seat belts for three in the rear. Personally, I think they should have dispensed with the middle position and have gone with a pair of sculpted semi-bucket seats instead of the 60-40 split folding bench seat offered. Here, you would stick a fold down armrest with a pair of cup holders in place and have a more comfortable seating situation. As it stands, the back seating area is snug. The Touring edition’s cabin is marked by door to door sculpting with soft-touch materials used liberally across the dash and on top of the doors. 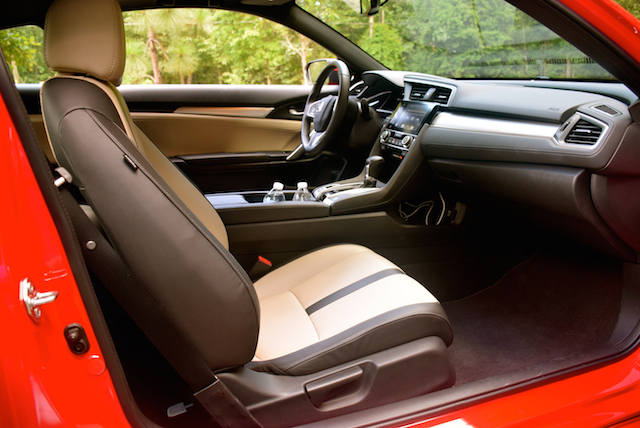 Harder plastics, brightwork trim, and leather-covered seats are also present. Leather also extends to the steering wheel and to the shifter knob, giving this model a high-end feel. Check out the instrument panel — it is divided into three puzzle piece-like sections with the speedometer fixed to the middle and other driver details flanking same. Attractive large and colorful displays provide the panel with “lift” and suggests a more expensive model. The expected steering wheel-mounted secondary controls are also present. The center stack is marked by a 7-inch color audio display featuring Honda satellite navigation, SiriusXM satellite radio, HD radio, Bluetooth connectivity, and a rearview camera. Knobs and buttons managing the climate control system are underneath, followed by a large, open storage area. Sit your smartphone there and then connect it to the USB port hidden away beneath the floating console. By the way, this model is both Android Auto and Apple CarPlay compatible — sweet! The transmission shifter and drive mode switch split the front seats as do a pair of cup holders and a sliding armrest. I’m not quite the small car guy I once was, preferring a larger vehicle and the attendant supportive seats that come with it. Credit Honda with developing front seats, which are comfortable and supportive in this Civic. Perhaps the only thing I would have liked is a seat extender, something typically offered in luxury cars. Otherwise, I was able to find a seating position comfortable for me by adjusting the steering column and seat accordingly. Take this coupe on the road and you’ll quickly discover that its fun factor is found in its small, turbocharged engine. It’s the first turbo placed in a Honda US model and the most powerful engine offered in a non-Si model. Combine this model’s light weight (2,739 pounds) with a boosted engine and you have the makings of a fun ride. With a 0-to-60 mph time coming in at just under 7 seconds, you’ll be forgiven if you use the “pocket rocket” term to describe the coupe. Press on the accelerator and the Civic Touring responds with its standard, muted force before the turbo kicks in. Hit 1,700 RPM and the turbo spools up fast with very little lag of note. To mitigate lag, Honda employs a turbine twin-damper design and I think you’ll be pleased with it. As for pedal play, the work is entirely synthetic. That’s another way of saying this model has “electronic throttle control” or “drive by wire,” an all-electronic arrangement whereby the cable connecting the accelerator pedal to the throttle valve of the engine is eliminated. In its place is an all-electronic system to detect pedal position utilizing sensors. Information is relayed to a computer which immediately activates the throttle by way of a DC motor. Did I notice a difference? No, and neither should you. What most likely will not please purists is the CVT. Introduced in 2014, the CVT is now an integral part of all things Civic and that’s something that isn’t likely to change. A CVT provides better fuel mileage than an automatic and that’s probably the overarching reason Honda offers one. As for the “rubber band” feel, it is still there. Especially under hard acceleration. Honda’s engineers did program the CVT’s software to have seven fixed ratio points for engine braking as well as for quicker kick downs when enhanced passing power is desired. But no matter how you describe it, the CVT feel is present. You do have the option of choosing a 6-speed manual, but only in the base LX edition powered by the naturally aspirated engine. The 2016 Honda Civic Coupe earned the Insurance Institute for Highway Safety’s Top Safety Pick+ award, the institute’s highest honor. Aiding in that cause is a bevy of standard features. Those features include a suite of airbags, stability and traction control, electronic brake-force distribution, brake assist, and a multi-angle rearview camera with guidelines. The Touring edition raises the safety quotient by adding forward collision warning, lane departure warning, a collision mitigation system, and road departure mitigation. The added features compose the brand’s Honda Sensing package. 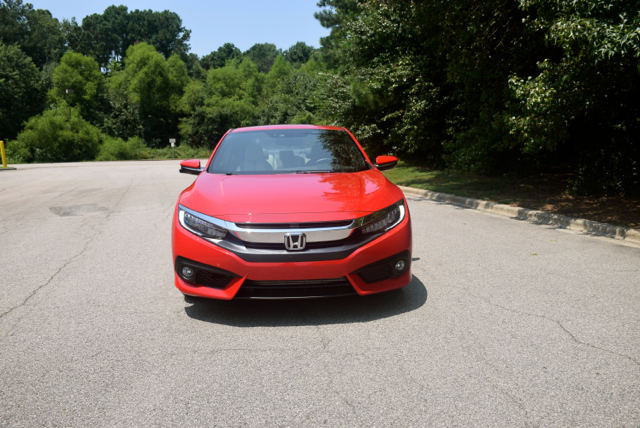 From stem to stern and from inside and out, the 2016 Civic Coupe provides a compelling reason for current Civic owners to stay in the fold, notwithstanding the CVT. Yes, the new style is polarizing, but it is also energetic and anything but boring. Judging by the strong sales through July (17.6 percent gain), consumers are voting for the Civic with their wallets. That fact also represents a trend that bodes very well for this model as it is poised to take over the best-selling car title from the midsize Toyota Camry sedan this year.